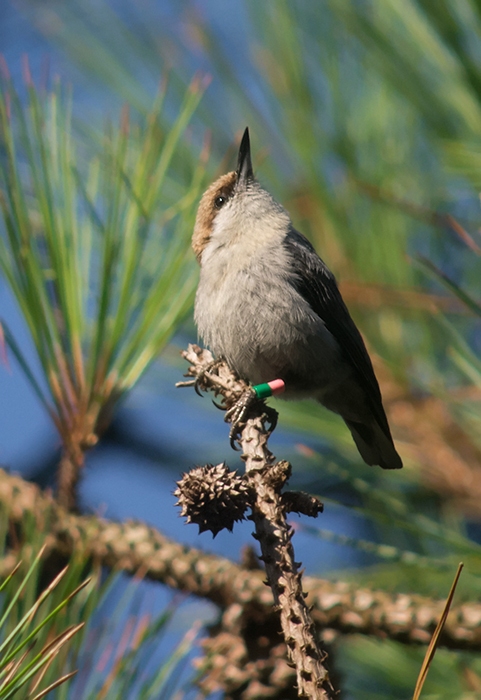 On February 22nd, 2018 at 6:00 pm Jim Cox from Tall Timbers Research Station in Tallahassee, Florida will present his plan for re-introducing Brown Headed Nuthatches into Jonathan Dickinson State Park (JDSP). Mr. Cox’s presentation will be held at JDSP’s Kimbell Education Center as an admission free event, sponsored by the Friends of Jonathan Dickinson State Park. Nuthatches excavate cavities in dead pine trees and very likely were lost from the park because of logging in the 1940s and prior. Since the park opened in 1950, South Florida Slash Pine has returned vigorously, and there are now enough dead trees, or “snags”, in the park where nuthatches can create cavities. Brown-headed nuthatches are small, vocal birds which are conspicuously absent in the local area but are not listed by FWC or USFWS as threatened or endangered. Nuthatch populations will be managed in such a way in St. Sebastian River Preserve State Park (SSRPSP) by Jim Cox and park staff that will allow biologists to selectively move groups to JDSP without harming the population from St. Sebastian over several years (with appropriate permits from FWC and USFWS). The nuthatch reintroduction fulfills the Florida Park Services mission “to provide resource based recreation will preserving, interpreting, and restoring natural and cultural resources.” Re-introducing nuthatches into the park highlights the outstanding natural resources of SSRPSP and JDSP, the commitment to managing for biological diversity by the Florida Park Service and Tall Timbers Research Station, and the positive results that can be achieved when state agencies and the private sector partner to do the right thing for our natural resources for the good of the public. The Kimbell Center is located four miles from the park’s entrance. Park entry is free for this event. Registration is requested. For more information, contact the Kimbell Center, 561-745-5551, libby.reinert@dep.state.fl.us.